Have you ever had an encounter with a black bear or know someone who has? Every year, thousands of times across the state of Washington, the paths of humans and bears cross as each goes about their daily routine. In recent years, human-black bear encounters have risen as bears seeking out food sources are drawn into backyards and gardens by the aromas of calorie-rich garbage cans, compost piles, pet food and bird feeders. 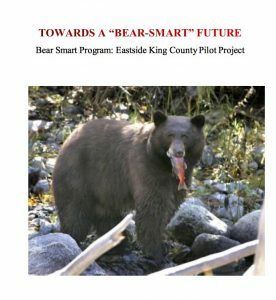 To address this concern, Western Wildlife Outreach has teamed up with the Washington State Department of Fish & Wildlife to develop Bear Smart King County — a new outreach program to help local communities stop or prevent human-wildlife conflicts, especially those with black bears. 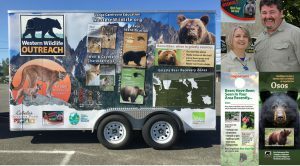 Through engaging presentations, informative brochures and the interactive Large Carnivore Education Trailer, WWO’s wildlife biologists, naturalists and trained volunteers help communities take proactive steps to make sure that bears remain wild and people stay safe. 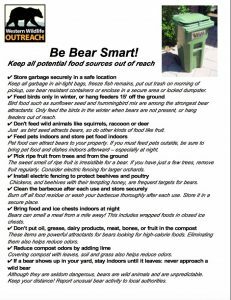 Conduct a “Bear Hazard Assessment” of your community, where ever it is – City, Farm, Business, Home – and recommend proactive steps to reduce bear conflicts and help with ongoing wildlife monitoring efforts to keep conflicts minimal. Black bear rummages for food in unsecured garbage can in residential neighborhood in Issaquah, WA. Provide workshops on safe black bear coexistence techniques to keep bears in their own habitats. 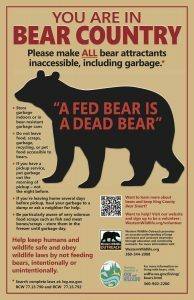 Volunteer to help Bear Smart King County here. Donate to support Bear Smart work here. Keep up with daily happenings through following King County Bear Smart on Facebook! 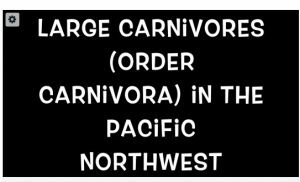 If you would like to have WWO install a kiosk of wildlife safety brochures, provide a presentation to your community group on the biology, ecology and behavior of the four large carnivores native to the Pacific Northwest, and steps to safely coexist with them, or host an educational display and presentation at your event with the Large Carnivore Education Trailer, please e-mail lorna@westernwildlife.org or call our office at (360) 344-2008 for further information.